It’s getting close to bedtime, and you’re winding down from a long day: a book, some Netflix, a glass of wine and . . . maybe a nibble or two. It’s so satisfying to have a snack right before bed, whether it’s a handful of chips, some leftovers, or a couple (or a couple dozen) squares of chocolate. But conventional wisdom says that eating before bed can wreck your weight loss goals like nothing else; it’s part of the reason why many people find intermittent fasting so helpful. Still, is there any truth to this long-held belief? POPSUGAR talked to registered dietitian Kristin Kirkpatrick of the Cleveland Clinic’s Wellness Institute to get some answers. Kristin confirmed that eating before bed can, in fact, cause you to gain weight. It comes down to two different factors. For one thing, she explained, “You really have no need to fuel at that time.” If you’ve already eaten a satisfying dinner, you should have enough energy to get you through your last chores of the day and into bed without any extra calories. Eating when your body doesn’t actually need or want the food – fueling past the point of fullness – turns into overeating, which can definitely cause you to gain weight. 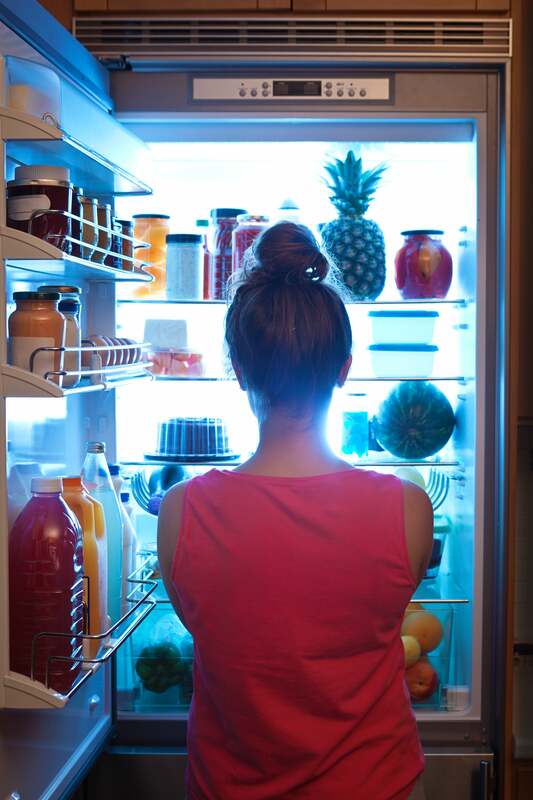 Eating before bed can also cause weight gain because of the headspace you’re in at the time, and the kinds of foods you’ll likely be drawn toward. Those typically come down to cravings, emotional eating (foods that will make you feel good, especially when you’re stressed or tired), or just bad routine. The choices are usually unhealthy (sweets or empty, processed carbs) and can lead you to overfuel. All of this leaves your body, at the very end of the day, “with more calories than it needs or wants,” Kristin told POPSUGAR. When you head to sleep, those calories can get stored as fat. Stopping your daily food intake four hours before bed is Kristin’s “gold standard,” she said, but even a two-hour cushion is good. “At least that gives you a little more time to burn off the energy,” she said. Before you reach for the snack cabinet, though, Kristin advised taking 10 minutes to do something else. It can be anything, as long as it’s distracting: folding your laundry, prepping your lunch for tomorrow, taking a shower. Then, see if you’re still hungry. “Chances are, you were just bored,” she said.